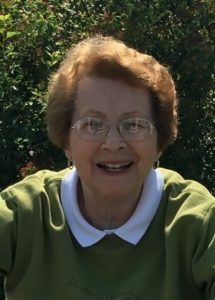 JoAnn Mae (nee Coulson) Ailport Dreistadt, age 88, of Hudson passed away on Wednesday, April 10, 2019 at the Hudson Hospital. She was born the daughter to Clarence and Mabel (Sand) Coulson on May 30, 1930 in Grange Hall, near Plum City, WI. She married Hubert “Toby” Ailport in November 1947 and to this union was blessed with five daughters. After Toby’s death in 1977 she was united in marriage to Rev. Henry Dreistadt on December 28, 1984. JoAnn loved her family immensely. She cherished family gatherings, reunions and birthday parties. She found great joy in dancing, picking berries, cooking for her family and always having candy for her grandchildren. JoAnn enjoyed traveling and car rides. She will be remembered for many things, including the recent thoughtful goodbyes to all of her beloved family. JoAnn is survived by her husband, Henry Dreistadt; daughters, Star (Chuck) Flanscha, Crystal (Mark) Larsen, Spring (Robert) Loberg, LaRee (Aaron) Peters; step-children, Steve (Jenny) Dreistadt, Sue (Steve) Watters, Karen (Brian) Gresback, Kathy Hilden; 19 grandchildren; 42 great-grandchildren; brother, Harold (Doris) Coulson; family friend, Gretchen Link; as well as numerous relatives and friends. She is preceded in death by her first husband, Toby Ailport; infant daughter, Larie Edna Ailport; brother, Kenneth Coulson; and infant great-granddaughter, Farrah May Hillman. A memorial service was held Tuesday, April 16, 2019 at 11:00 am at the United Methodist Church (127 S 2nd St.) in River Falls. Visitation was Tuesday from 9:30-11 am at the church. Interment will be in Greenwood Cemetery. In JoAnn’s wishes, she requested no flowers for her memorial service. In lieu of flowers, memorials may be directed to the charity of the donor’s choice or River Falls United Methodist Church. Arrangements are with Bakken-Young Funeral & Cremation Services.